Only about half the time do I like to do such precision piecing. I have to be in the mood for it. But every time I do it I get pretty excited by the results. Templates or paper piecing or just really good cutting, they all work. So when Malka Dubrawsky asked me to check out her her latest pattern and share it here I couldn't resist. It is a graphic pattern, that gives finishes to a rather cool quilt. 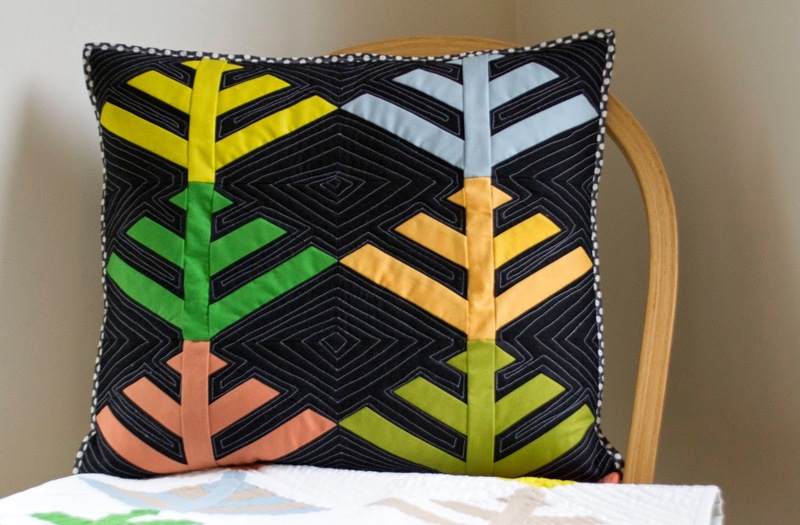 Malka provides layout for a pillow and a quilt in the pattern. But you could easily change the size of the quilt but adding or removing blocks. I made my block in about 30 minutes, but that was 30 minutes of supervising and providing snacks for 2 kindergarteners. And sewing upstairs to watch them play, but still cutting and pressing in my basement studio. Not very efficient! It is wonderful for me to support quilting friends like this. Malka and I have only had a couple of brief conversations in real life. We live in totally different worlds - oh her heat of Texas. But we bond over swimming and colour. And I really credit her with my low-volume obsession. She was the first person to use the term and share examples, as far as I can tell. Make sure you check out her blog too, always full of her glorious colour and pattern. The pattern is available in Malka's store, pick it up here. Malka has very generously offered to give away two copies of the pattern to readers here. If you'd like a chance to win a pattern, leave a comment - make sure I can respond to you. Tell me your favourite colour, your favourite artist, whether you've ever been to Switzerland, or even what you had for breakfast! Giveaway open until May 14, 6:00 pm MST. I had oatmeal with blueberries and hemp seeds for breakfast, but sometimes I have Swiss Muesli! i had special k for breakfast...haha. i love Malka's fabric and her color choices. she truly is an artist.. I had Red River Cereal, and I haven't been to Switzerland, but I did date a guy who was a dual citizen? Does that count? I made a black pillow once, although yours is much cuter. I quilted it with black thread. Stupid me. That quilting in the lighter thread really shows up. Now I know what to do next time. I love the simple elegance of this pattern. Currently my favorite colors are blues and greens. I had greek yogurt with muesli and banana for breakfast - love the simplicity of these trees and the creative genius to take something seen to a quilt pattern! New to paper piecing but I see these trees in purple and greens on gray. Thanks to both of you. I had an egg from my own chickens this morning (yum). With a side order of bickering college students (yuk). Kindergarteners sound peaceful. My favorite artist is Marc Chagall. Those colors. Thanks so much for the chance to win. I saw this pattern on IG I think and really found it intriguing. Love the simplicity of the tree lines. I am making a quilt for my sister who lives up north here in Wisconsin. It is full of bears and other "up north" pieces of nature. Have been lamenting about how dark it is and that it needed something to make it pop. This block is just the thing. Would love to win the pattern. The closest I've come to Switzerland is the base of the alps in northern Italy. Love the blue of the sky against the green hills. i love carl larsson and james tissot. I love all colours, three combinations that I seem to attracted to are blues and greens, reds and oranges(sometimes purple too), and finally purples and lime greens. But my favorite color is red. We spent time in Bern a few years ago... one of the nicest cities in the world and the people are lovely! What a beautiful, modern quilt! Breakfast? Hmmm...Activia yogurt with dried apricots in it. I love paper piecing--and this block. So clean and precise! that is a really fun effect the repetition of that block gives! I had green juice for breakfast. I'm trying to be more health oriented so I dusted off my juicer and had a liquid salad. boring! I had an energy bat for breakfast. These trees are just wonderful! Thanks for the chance to win. I love this block in the larger quilt. Wonderful! My favourite colour is pink. My favourite artist is Monika Kinner-Whelan. I've never been to Switzerland and breakfast is Nature's Path Sunrise cereal with almond milk. I've been to Switzerland twice. The first time was about 25 years ago and I stayed in a small village for a couple of days and also went to Zurich. I saw some Chagall windows in a church...amazing. The second time was about 4 years ago with my husband and two children who were late high school early university aged at the time. We really only had time to stay overnight in a hostel...between Germany and Italy. It was a very nice hostel as I recall but I guess it doesn't really count. I love all things Malka Dubrowsky and have a bunch of scrap fabrics of her stuff. Would love the pattern - thanks for the giveaway. Love this modern looking pattern! My favourite colour is Kelly green and I had toast with peanut butter and apricot jam for breakfast. (And black tea) thanks for the chance! When I was very small, I decided that Paul Klee was my favorite artist. I'm not sure that he is still my one and only favorite, but i still love his work. Love the tree pattern and have always been a big fan of Paul Klee -- I'd love to be a winner! I love trees of all kinds and I hope to one day make trees the focus in a quilt - with some blue, my favorite color. I really love aqua and orange right now. They make a great combination. Switzerland about 30 years ago (really?? It has been that long??!!?). We were living in Germany (Army) and traveled to the Lauterbrunnen area. Of course we went to the observation area of the Jungfraujach - a very high mountain area. My then 6 year old daughter slipped and nearly went through the bottom opening of the guard rails. That was a heart stopping moment. I also remember sitting in a small resturant that evening, all of us enjoying melted cheese on everything! Kids had a great time dipping and eating. They were adventurous eaters - which is good when you are living and traveling in another country which at that point still had few American franchise food outlets. Hubby is making breakfast while I check out my favourite blogs. Malka's trees are just wonderful and I need to give them a go. Love the black background cushion. I LOVE this pattern!!! Thanks for the giveaway! I once saw quilted interpretations of the Bayeux Tapestry and another of Van Gogh's Starry, Starry Night. Both just blew me away. I think Malka may add to the really good fine-art-to-fine-sewing milieu with her Klee's Trees. I've always been a fan of Paul Klee, too. I was part of a small group of artists collaborating on work, and one of the other members introduced us to him - great stuff! 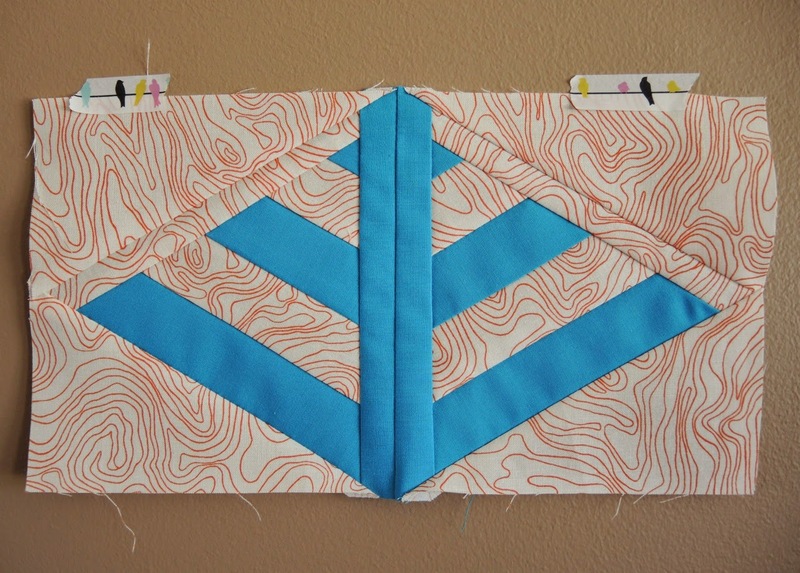 I have been reading her blog and watching the development of this quilting pattern. I love the graphic line and the colors. She is an awesome designer. I've been watching these trees slowly populate the various blogs and social media. They are lovely. 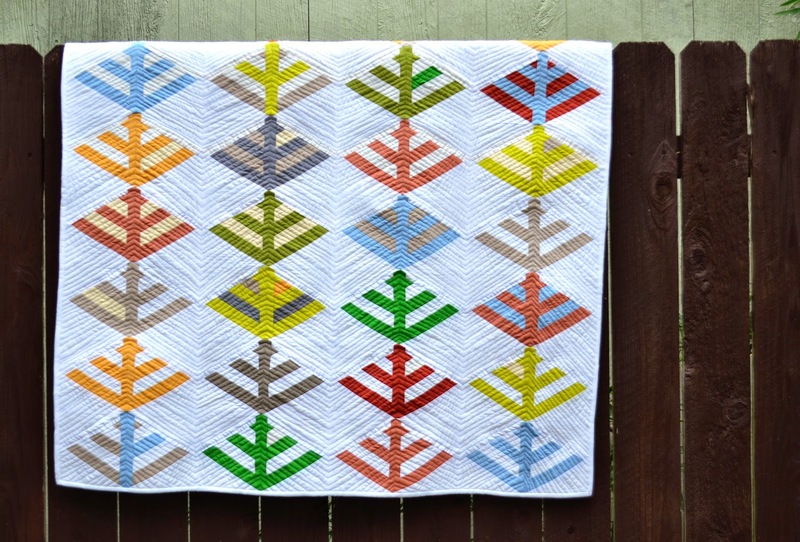 I love Klee and I love the pattern - and I always wanted to make a tree-quilt! Klee has always been a favorite! I just saw the Miro exhibition at the Seattle art museum and his work could inspire a great quilt as well! I would love to give this quilt a try - it's beautiful. Switzerland is a beautiful country and we explored a tiny portion of it. I would love to return but in the meantime it would be great to win a pattern inspired by Paul Klee. I would make it in my favourite shades of green after my steaming bowl of oatmeal. Orange. Karl Brullov or Constantin Brancusi. Never but I was close to there and have had a ton of Swiss chocolate in my life - I'll probably go one day. And coffee, with brown sugar.